Up to 40% of dental injuries are sustained during sports activities. NOT wearing your mouthguard makes you 60 times more likely to sustain an injury to the face and mouth. 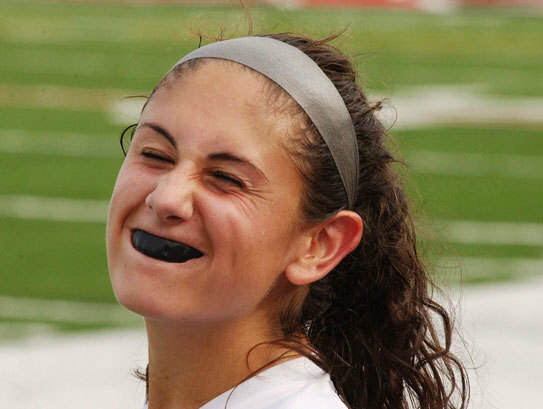 We know that a lot of people avoid wearing mouthguards because they’re uncomfortable. They get in the way of speech, and sometimes hamper breathing. They can also put stress on one’s jaw if it doesn’t fit right. Custom-fit mouthguards are more comfortable than stock mouthguards—even the boil-and-bite ones. They’re less bulky, which makes talking, breathing, and swallowing easier. The initial appointment to fabricate a mouth guard is to have an impression taken of your mouth. Within a few days the guard is made in our office and its comfort and bite is checked. Simple instructions for the care of the guard are given and most important if there is ever any problem wearing it during activity you must tell us. For more information regarding sports dentistry, please visit our website. Mouthguards are recommended for just about every sport—basketball, baseball, soccer, skating, or any activity where your face may get hit by an elbow, a ball, or the ground! Talk to us about a custom mouthguard fitting to avoid injury and to stay at the top of your game! Stay safe, and thanks for your trust in our practice.